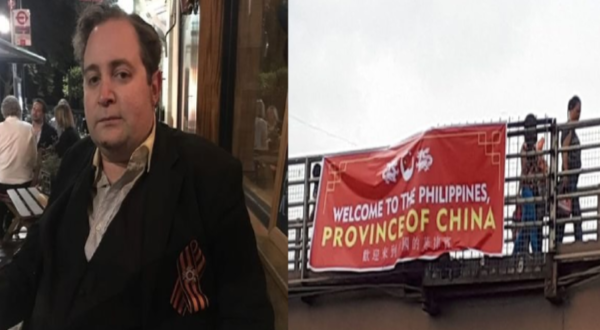 Adam Garrie, director of Eurasia future and a geopolitical expert wrote on Tuesday that the people who put up the banners from bridges reading “welcome to The Philippines, province of China”, are committing "national homicide". "The underlying message of the banners reflects a dangerous and irresponsible policy on the part of many of Philippine President Rodrigo Duterte’s opponents which seeks open hostility with China," he said. According to China’s Ambassador to the Philippines Xiao Jinhua said that the banners unfurled on the two year anniversary of a UN arbitration ruling in favour of The Philippines regarding South China Sea claims were seen as offensive both to China and to Filipinos with Chinese heritage. Garrie said that a good relationship with China would be a chance to accelerate the pace of long term sustainable development. He said that with China looking to invest in economies throughout South East Asia, The Philippines stands to gain greatly by encouraging further Chinese investment throughout all regions of the country. Garrie said that the Liberal Party, alongside Senator Antonio Trillanes is allegedly preparing the military for a possible confrontation with China. He said that should war should break, the Philippines is under-equipped . "Even if the US would fight a war against China on behalf of The Philippines, something that is almost certainly never going to happen, how would Filipinos benefit from having two nuclear superpowers destroy The Philippines in large scale war irrespective of which nuclear superpower won?," he said. "A country like The Philippines can and should benefit from opening up internal markets to foreign investment from every wealthy country in the world, so long as these agreements are done on a free and fair basis that do not bind The Philippines into any entangling long term alliances," he added.